Firewatch is one of those games that manage to tell more in a few hours than most games do in a few dozen hours, it's a believable story full of intrigue, unknown and natural interactions between people, all wrapped with a positive message about life and finding the enjoyable parts in each sad story. The story follows Henry, a fire lookout in the Shoshone National Forest, hired following the Yellowstone fires of 1988 in order to increase the security and report any potential fire threat so it can be prevented before it's too late. Trying to escape the tragic recent events in his life, Henry decides to take the job for the summer in hopes that the silence and loneliness would help him reflect on life and move forward, but that silence only lasts for a little while, as the Shoshone National Forest seems to be a place where a lot of strange things happen. Joining him on the journey is his lookout boss, Delilah, to whom he is supposed to report any suspicious activity around his lookout as well as perform any tasks given to him by her, but as the summer goes by their relationship grows closer and the interaction between Henry and Delilah takes center stage in the game. Campo Santo's biggest achievement with Firewatch is presenting the story in a way that feels natural and believable, as if it came straight out of a classic novel, with the conversations taking a more relaxed and natural dialogue, instead of something that feels scripted; part of that can be attributed to the fact that Henry can answer Delilah's questions and interact with her in a bunch of different ways, either by being serious, funny or even flirting sometimes, but no matter which dialogue option you choose their conversation will always feel natural and that can be heard in the actors' voices. Even if it starts in a more relaxed open manner, the story does get spookier as the days go by, but Firewatch is not a horror game and it doesn't even attempt to be one, because that's not what this story is about, instead the game uses the loneliness of the woods and the missing pieces of the bigger puzzle to always keep you on your toes and look twice behind your back, even if there will be nothing else behind you, except more forest. A few days in the game reaches its peek of mystery as you'll try to make up scenarios about what is going on before the game tells you and because that suspense is so high it does feel like a disappointment when the game does reach its conclusion, but that is something that I would rather not spoil for you, so you can find out what Firewatch is all about on your own, because truly the story is one of the game's highest points. Although it may seem like another walking simulator at first, Firewatch blends the lonely walking though the woods with suspenseful moments as well as freedom of exploration, as aside from the main objectives you can often stray from the path to find different supply caches, collectibles and even adopt a turtle. Even if at first your movement options will be limited, you will eventually find gear that will naturally unlock new areas of the map, as ropes will allow you to descent steep hills and the axe will allow you to chop through any trees blocking your way, and although those are your main and only traversal options, finding each gear piece as the time passes by makes it feel like you're never doing the same thing for too long and always finding something that may aid your adventure onward. Another thing that you will do a lot of is talk to Delilah on the walkie-talkie, as your conversations are seamlessly incorporated into the gameplay, allowing you to report any findings to her, ask for advice or just hear a familiar voice when you're out in the wild and feeling lonely. The way in which you respond to Delilah will also affect your relationship to her, as if you crack a joke she will remember to return the joke the next time the opportunity pops up, making the whole conversation feel tailored to the way you respond as Henry. Considering the fact that there isn't a lot of variety when it comes to the map and the locations you visit, since most of it is just forest with the objective locations being pretty obvious even on the map, it's quite surprising how drastically the map changes according to the time of day and the weather, as the forest will spark up with nuances of orange, bright red or clear sky blue depending on the day, the location and the time. The only missing thing that seems to have been overlooked is the lack of wildlife and plants variety, even if the area in which the game takes place is just a forest, it's disappointing to see that most trees look similar and animals or birds are nowhere to be found, except for your pet turtle. Even if there are a couple of tunes that will play during key moments of the game, for most parts you'll be stuck with the sounds of nature, which isn't necessarily a bad thing since the silence of the wind blowing through the trees adds to the atmosphere, but once again it feels weird to hear the sounds of the forest without any birds chirping in the distance. On the other hand the dialogue is excellent, with the actors genuinely feeling like they're having an actual conversation, as both Henry and Delilah's dialogue feels natural, with occasional laughs, pauses and even angry outrages. 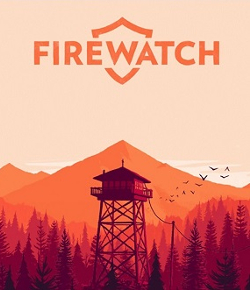 Firewatch is a quality, but short game, as the entire experience takes around 4 hours to complete, and since there are no additional modes or a reason to replay the game, that's pretty much all you get, so you either liked the story and the message enough to justify the purchase or you don't, but if you like environmental exploration games with the focus on storytelling you most likely will. Firewatch tells an intriguing story full of mystery, suspense and wonder, the like of which you may only see in some more toned down Stephen King novels, but adding on that with great voice acting, superb, although sometimes repetitive, landscapes and gameplay elements that feel simple enough to allow anyone to play through this game.